Chris and Jenna Keane. All pictures are by Santa Cruz photographer Phil Horne. Can centuries of tradition be wrong? Yes! 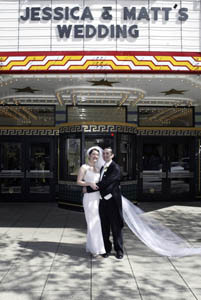 Metro Santa Cruz presents 10 wedding traditions you might want to rethink. It's your wedding--be with the people who make you happy! If you want something small and intimate, don't feel like you "have" to invite Bob from accounting or your grandmother's neighbor. Culling a guest list is hard, but looking over a crowd of barely familiar faces as you say your vows may not be what you're dreaming of. On the other hand, if you want a big party that your budget or ceremony venue won't accommodate, consider having your reception at a park or beach--somewhere that doesn't charge per head. Do-it-yourself invites are great for the couple who is short on cash but long on creativity. If that isn't you, consider the vast wealth of wedding paraphernalia that is the Internet: sites like mygatsby.com and papergirl.net have fabulously beautiful invitations for fabulously reasonable prices. Unless you're going superformal, address the envelopes yourselves--no one will notice that you haven't hired a professional calligrapher, and it could save you a couple hundred dollars. Above: Rick and Sandra Harker. 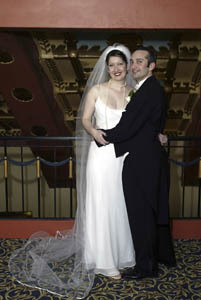 Increasingly, people are picking wedding dates that have significance to them. Consider getting married on the anniversary of the day you met, the day your parents got married, the day you first kissed. And it doesn't have to be at 6pm on a Saturday night, either. In fact, if you have your wedding at an "off" time--a weeknight or during the day on a weekend--you're much more likely to get a good deal on the venue rental (and much less likely to run into a "Sorry, we're booked" scenario). 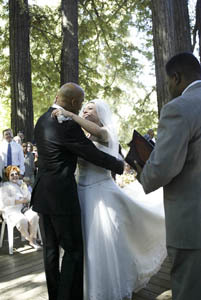 Instead of a minister or a justice of the peace, take advantage of the fact that California state law allows anyone to officiate over a wedding. All you need to do is have your preferred officiant (your best friend, your brother, that guy on the corner) pick up a one-day license at the registrar's office. It's a good idea to do this the same day you and your partner pick up the marriage license, to make sure there aren't any mix-ups about the date. The author, pictured here with husband Matt, put her nontraditional money where her mouth is when they held their wedding at the Del Mar. Think outside the box! Churches and restaurants aren't the only places in town to tie the knot. Brainstorm with your intended about places you love, even if they don't seem particularly wedding-oriented. Santa Cruz has a wealth of parks and beaches that provide an ideal backdrop for romantic moments. An historic site like Sesnon House or the Cocoanut Grove is ideal for anyone considering a vintage wedding, and artsy sorts will fall in love with the Museum of Art and History downtown. Or get really creative--have your wedding at your favorite bar, or a movie theater, or a bowling alley. More and more people are getting married without bridesmaids or groomsmen ... or with bridesmen and groomsmaids ... or with two maids of honor ... you get the idea. Dressing like a meringue isn't for every bride. Let your personal style dictate your personal brand of wedding attire--nothing is stopping you from wearing red, or blue, or green polka dots. You may hear people say, "But how will they know you're the bride?" To which you can reply, "I'll be the one getting married." It doesn't have to start with "Dearly beloved" and end with "You may kiss the bride." Pick up a copy of I Do: A Guide to Creating Your Own Unique Wedding Ceremony by Sydney Barbara Metrick--or, better yet, sit down with your betrothed and talk about what's really important to the two of you. Some of that can and should be incorporated into the vows, but having a heart-to-heart with your officiant about the ceremony wording can make your wedding that much more personal and unique. Jessica and Matt Neuman Beck. It's only in the past 20 years or so that having a sit-down meal at a wedding became du rigueur. People used to make do with a wedding cake and some punch--and it wouldn't have occurred to them that they were missing anything. Nowadays we're so accustomed to being fed at a wedding that some sort of nonsugary sustenance is a good idea, but a cocktail hour reception with trays of hors d'ouevres can quell an appetite almost as completely as a three-course dinner (and for about a third of the cost). Have all the housewares you need? Nearly every store has some version of a wedding registry, including but not limited to REI (for outdoorsy things) and Amazon.com (for ... everything). An added bonus: most registries can be accessed, updated and in some cases even created online. From the January 21-28, 2004 issue of Metro Santa Cruz.